Gents, this week I’m reviewing a Laphroaig 10 year old. I mentioned my purchase in my last post. The 10 is the staple from the Laphroaig Distillery and retails locally for around $80. Money well invested if you ask me. This whisky is another Islay single malt. Its one of the big three for peaty flavours (the others being Lagavulin and Ardbeg). I found the 10 to be a great dram. It was nice on the nose with hints of butterscotch and very light syrupy aroma. Like the Ardbeg it is obviously strongly flavoured with a peaty smell. The addition of some water had a notable affect on the nose, with all hint of butterscotch gone and a much smokier flavour present. I find the Laphroaig to be much smoother than the Ardbeg, although not as smooth as the previously reviewed Laphroaig Quarter Cask. It sounds corny but my tasting notes say ‘smokey velvet’ (I’d had a few by then). There is a hint of salt to the flavour and the dram goes down with a viscous syrupy texture. The colour of the Laphroaig is a deep golden caramel. It’s much darker than the Ardbeg but doesn’t have as strong a flavour. 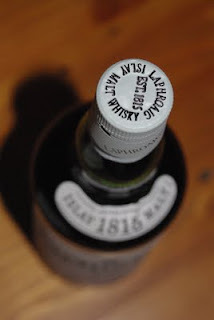 If you have the time the Laphroaig website is worth a look. There is all the usual stuff you would expect, product descriptions, distillery history, branded paraphernalia etc… but there is also Laphroaig TV which if you’re interested in Islay whisky is worth a look. My personal favourite is a video about the woman who makes whisky scented soap. I’ve spoken to Mrs Colonel about this and she has refused me permission to purchase some of this for the shower (apparently I already reek of whisky far too much of the time). The website also has the Friends of Laphroaig section with forums and other member stuff. This is the place where you can acquire your own plot of land on the distillery grounds. Nice bit of fun that. To sum it up, I’d recommend this whisky to anyone. If you find the Ardbeg a bit much, you might prefer the Laphroaig. It’s a bit mellower and smoother drinking. I really like it. I’m going to give it a rating of 5 lightning bolts (out of possible seven).